Armed police raided a Peterborough home last night (Tuesday). Teams of armed officers swooped on the house in Lutton Grove, Westwood, Peterborough at about 9pm. One resident living near the house said she saw officers wearing balaclavas with laser sights on guns pointing in the house. She said: "There were a lot of unmarked police cars, with police at the front and back of the house. "There were wearing black clothes carrying guns with laser sights. "There were at the house from 9pm until 12.30pm. "It was very scary - we have not been told by police what was happening." 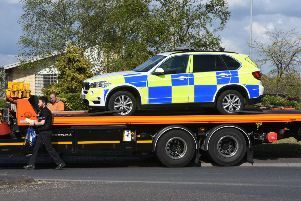 A spokesman for Cambridgeshire police said officers were executing a warrant in connection with suspected firearms offences. The spokesman said no-one was arrested, and no firearms were recovered.